Last night I got to put Thyron through his paces. My worst match ups by far are tough spam. I am leaning on my Issyria Alpha force at the moment to take a lot of match ups and getting toughed out of a game is an issue. 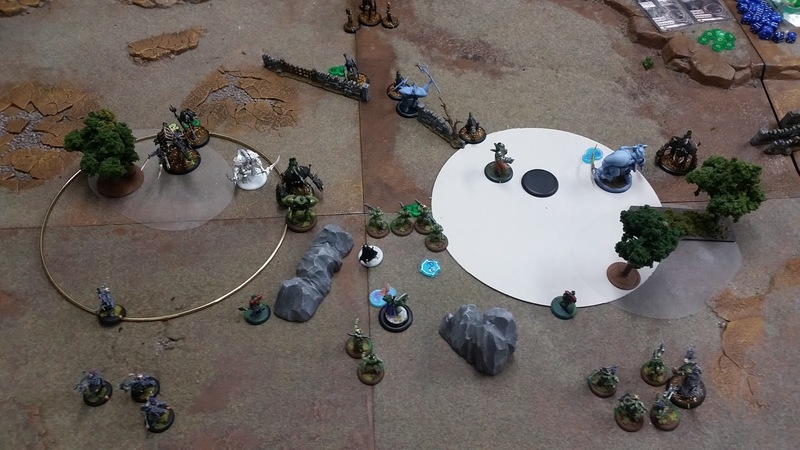 Before I would throw Ossyan or Garryth at the situation to try and out attrition them. Now with a side stepping grievous wounds Moros and Banshee I can throw them into a line of tough trolls and watch them crumble. Ideally the Griffons and maybe Moros charge up to sweep out the front skirmish line with the feat depending on necessity. 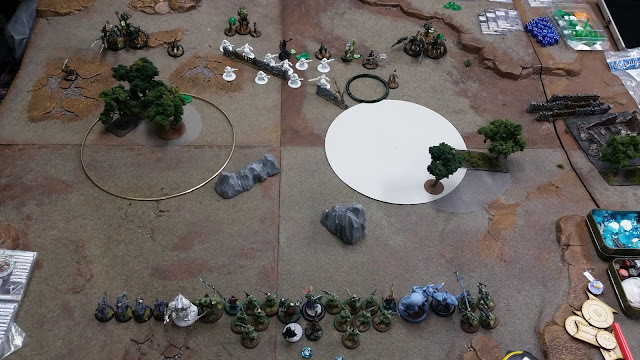 Then after fire support from the units Moros and the Banshee can lock down targets for the Stormfall Archers and the Invictors can get good flanks into the harder stuff in the center if need be. Seeing as I don't need the feat sidesteps to clear out infantry I am planning to use them to step around the marshalled jacks and kill the overseers. Assassination is off the cards, and there is no killbox, so I only need to be as far forward with Thyron as I need to be. However it is my first test drive so I will get him stuck in later. I also have to worry about his Stalker, that could be bad news for Thyron. 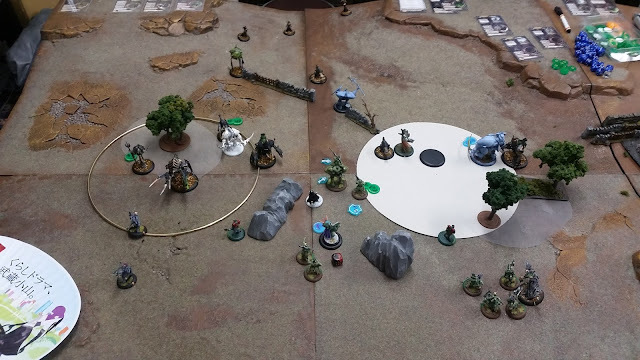 I wanted to mini feat the Invictors to take out some Biles on the first turn but didnt have the range. However I got some very lucky deviations and damage and AOEs piked off 3 biles. I step up with the Invictors, committing them to success or death. More fantastic deviations and one combine take out a few more Biles during his feat turn. I position up. A griffon runs in to tie up his center. He moved his units out of the zones and I scored 2 scenario points. Bile purge kills half the unit of Invictors, better results than I expected. Ghostly and Curse of shadows get used to make this happen. Some token shooting goes down from the Cryx side but overall I mitigated his alpha successfully. A War Witch Siren and 2 Machine Wraiths come in from the flanks to tie up my Stormfall Archers. Thyron upkeeps Stormrager on himself and assail on the Banshee. Hands out Focus. Activates and casts spell piercer. 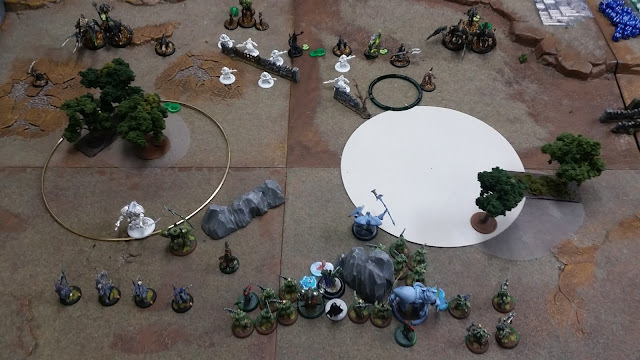 With Spell Piercer the Stormfall Achers on the left flank manage to kill teh Siren and the Machine Wraith however the ones on the right were not so successful. 2 of them however put some damage down on the jack in the middle of the zone. The Artificer charges the jack in attempt to sidestep and Beatback off it into the Death Ripper and Beatback that out of the zone. 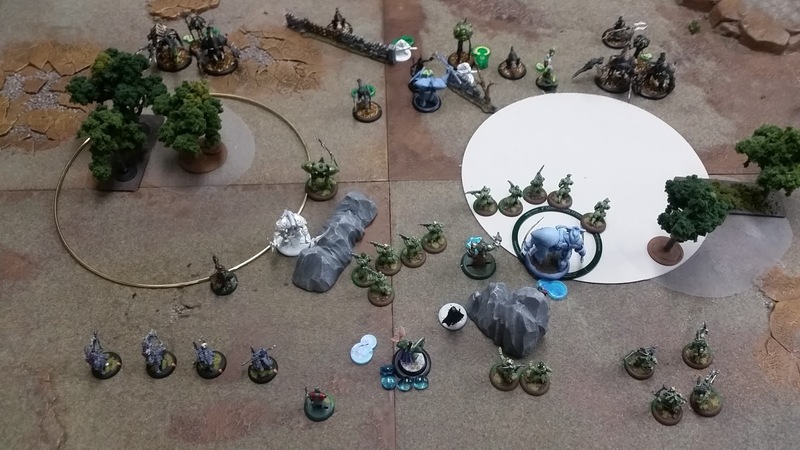 However even under Thryrons feat with MAT7 it misses both attacks on the jack and fumbles my plan for that turn. So the Banshee has to pick up where the Artificer let me down. With only 2 focus, a free charge and Concentrated power it charges off towards the central jack, leaving itself just at maximum reach range. It hits the jack, sidesteps to the overseer, hits the overseer and boosts damage to kill it, then it sidesteps back between both jacks, cleaves into its first target and wrecks it and then buys a final attack on the remaining jack. 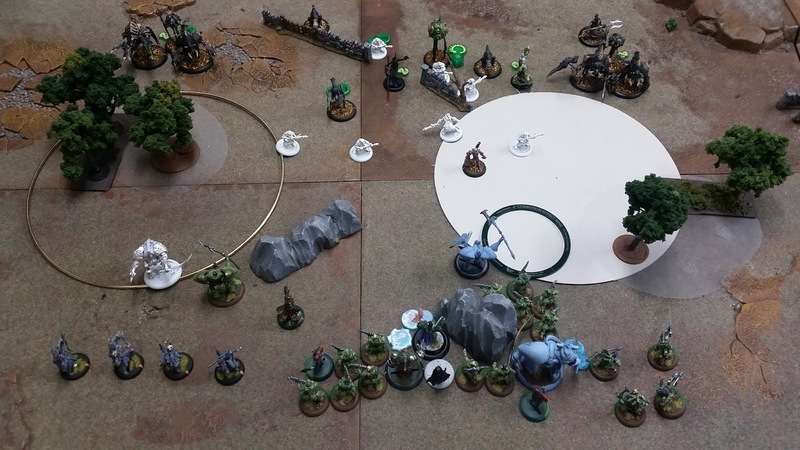 Cryx attempt to salvage the situation. The Stormfalls are half killed and break morale. The Slayer throws the Griffon into some Invictors killing 3. 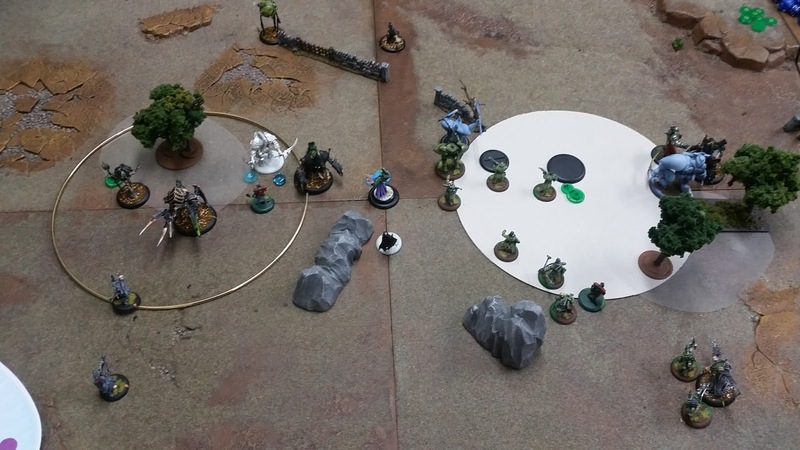 The Death ripper tries to kill the Artificer but he tanks it out. 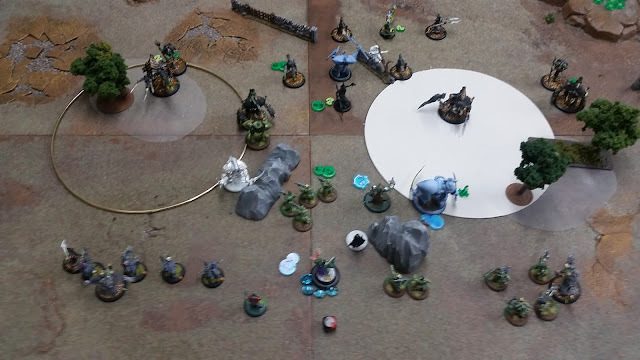 The other Slayer barely scratches the Banshee and the Slayer charges Moros but only takes off his force shield in damage. 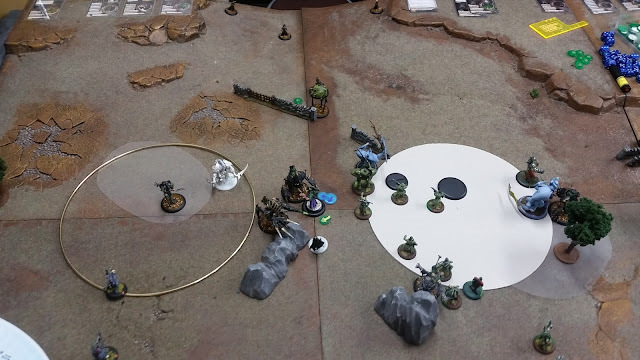 At this stage I was pretty confident that I could ride out the scenario for victory, however that was not the point of playing this proxy game with Thyron, so I charged right in to see what he could do. Sadly he missed his charge attack and didn't achieve much. On the other hand Moros killed the Stalker with only 2 focus and concentrated power so he was overloaded. 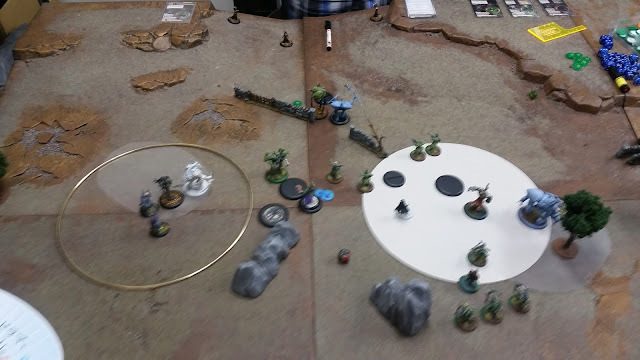 The Invictors picked up flank to kill the remaining Death Ripper and the Artificer did his job pushing the Slayer out of the zone, while the Banshee put some more damage on it. Cryx countered by a nice headbutt assassination run, but Thyron tanked it pretty well, standing up with 9 remaining hit points. The overseer didnt die, but the artificer turned around and after the Stormfall Archers unengaged from the Machine Wraith he Magno Blasted it. Still wanting to see what Thyron could do, he stood up and killed the Reaper then cleaved into the Slayer killing that too. However after spending all of his focus he was still vulnerable to assassination. At defence 19 my opponent needed 10s to hit., boosted and connected. Then followed up with boosted damage looking for dice minus 6, a roll of 15 to kill and landed it. Thyron Sword of Truth first glance.